Webject provides a full portfolio of information technology services, open systems technologies, and support services for distributed computing environment. Client IT organizations have realized the benefit of utilizing our services. Solutions implemented by us for our clients have changed the way business information is used by them and has enhanced their overall competitiveness and responsiveness. Force Pharma Automation (FPA) is an online Sales Force Automation System for Pharmaceutical Companies. It allows linking all sales field personnel across the country with the Home Office. Force Pharma Automation Provides valuable information on Daily visits to Doctors, Chemists, Stockists, Primary and secondary sales, Product wise stocks with Depots and Stockists, Stocks of Samples/Gifts with Reps, Overdue invoices. FPA basically bridges the gap between the corporate headquarters and the representative, mobile in a remote location. FPA acts as a tool to keep the Medical Rep (MR) and the managers informed about the latest in the market and the Company news. Also it aims at reducing the drudgery of filling up long messy forms repeatedly and mailing two or three copies to the corporate office, re-entering the forms in another application package etc. This section provides facilities for filling in the doctor visit details & also samples & gifts distributed daily. FPA is a scalable and configurable model with no additional hardware that can be customized across any hierarchy or geographical breakup.The FPA system also incorporates a bulletin board and a feedback system that keeps him informed about the latest related corporate and technical information. OOPS was developed for a large phone company. Webject designed, developed, implemented and extended production support for OOPS. The solution involved conceptualization, application development, data migration, reports and querying modules. OOPS V1.0 is a client /server application using Visual Basic 5.0 and Oracle 8.0.3 OOPS V2.0 is an Internet application for the Order Entry and Processing. The front end of OOPS is a Web Browser. The WebPages are developed using Microsoft Active Server Pages, Java Script, VB script and HTML. The business logic was implemented with embedded Active X controls. PL/SQL is used for coding the server logic using the stored procedures in Oracle 8.0.4 on Windows NT Server 4.0. SyncDaemon The challenge was to fully automate the process of Import and Export of data from Oracle8.0.3 on NT server to DB2 database on AS/400 and vice versa. The process is triggered using NT scheduler every night for Export and every morning for Import. This process creates a snapshot at periodic intervals and refreshes the data on the oracle server keeping it in sync with the main DB2 database. The client is a large paper company having mills in different parts of the country. ODH is a suite of three different applications. Optivision Datawarehousing The challenge was to design and develop a system to fully automate the datawarehouse building process. Data is extracted from the Informix database from all the mills of the Paper Company located at different parts of US linked through a WAN. The extracted data is massaged to comply with the warehouse values and formats, to map the new columns, and also calculate values. This transformed data is loaded into a single database on SQL Server, which is maintained as a datawarehouse for the whole company. Data loading is scheduled for daily, weekly and monthly runs. The runs are scheduled in the Aswin scheduler to synchronize with the mills uploads. The process gets triggered through Aswin. As this is a real time system, the data has to be captured at predefined time frames to get the exact figures for Analysis. The system was developed in VB 4.0, SQL Server 6.0/6.5 on Windows NT, Aswin Scheduler - A Seagate Product. FMRS is developed for multi-user environment using Client/ Server Architecture for a big farm equipment manufacturing company. The challenge was to design and develop a single system capable of dynamically displaying the user interface depending on the language the user chooses. This system has capabilities to interact with several dealer systems in different countries, to import / export data into / from FMRS. This package can run under SIX different languages. The building blocks of FMRS are Import & Export from different databases, Reports, On-line data entry and National language Support (NLS). The user can run the package in a language of his/her choice. FMRS was developed using PowerBuilder 4.0 as the front end and SQL Server 6.0 as the backend. The client was a large Supermarket chain in Europe. ProMan is a project monitoring and management tool. The system equips the managers to schedule and monitor tasks. ProMan comes with a suite of powerful reporting features like Viewing all the Projects and activities in which an employee is involved. View all the projects of a department View weekly/monthly work done /allocated by/to an employee etc. The challenge is to automate the process of the insurance company's yearly audit of Committee on Quality Assurance Hedis is a set of performance measures that the auditor uses to rate the insurance company's health insurance plans. The performance measures are in the nature of ratios that are arrived at after running the reports against the data in the datawarehouse. Webject provided a pure PL/SQL solution instead of standard reporting tools. Stored procedures were written for the common modules making them reusable across the Hedis set of measures. Performance tuning, suggesting changes to the design of the existing schema, designing new temporary tables and query optimization were crucial for the success of the project apart from coding the modules. The process was automated using Unix shell scripts. Webject leverages its experience and expertise in software application development, GIS, data conversion and database handling to migrate Avenue scripts to ESRIs latest software ArcGIS. Avenue scripts are not compatible with the new release of ESRIs ArcGIS. Webject has several resources dedicated to execute migration projects of similar nature. Webject has to date migrated several Avenue programs to the new platform. Street Painter was developed for client that distributes phone directories and other materials in the continental united states. The application was done using the Map Info's MapX ActiveX control and SQL Server as the database. The application takes in a set of ZIP codes where the telephone directories have to be distributed. In addition a Job Boundary is provided outside of which the directories may NOT be delivered. Street painter has to keep track of the jobs in a multi user environment, create job definition files and allow for modification or deletion of jobs. Finally the application generates the Wall Map of the routes of all ZIP codes and Contractor maps for specific ZIP codes. The application gives various printing options to print as per the clients specifications. Webject developed the Map Viewer/Query application for the data available in Arc View Shape files. The scope included digitization of the drainage maps. The user will query in ArcView and the images will comeup in a Visual Basic viewer. The user can query based on TBM Page, Drainage Map Number, Location Info, Basin or Canyon name etc. An avenue script was written that identifies the query parameters and passes on the information to the Visual Basic application. The Visual Basic Application uses the Map Objects ActiveX control for loading the relevant raster images in the Map Viewer container. As and when the query parameters change the Map Viewer container application is updated accordingly. The user will be able to zoom in, zoom out, and pan the images. Webject developed PIMS to help a company, contractor, or government agency save money by efficiently managing the phases of a project. No more unnecessary long distance phone calls to clarify progress, no more questions as to what revision of CAD drawings are being referring to, and no more projects subjected to additional expenses due to lack of organization. PIMS provides an excellent single source location for groups to evaluate, collaborate, view status, and update the progress of a project all with a user-friendly web based interface. All content about projects can only be accessed through their individual project titles. The application also states all new updates related to the project since last visit to web application and are listed in the following subject headings within the main menu. 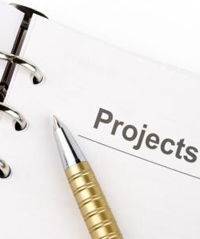 Each of the following heading has functionality that makes project management a breeze. The challenge is to automate the process of the insurance company's yearly audit of Committee on Quality Assurance. The scope included tuning the performance of the several measures on Oracle Data warehouse. INVOLVE is a web based Internet application that allows the suppliers of a large company to submit large number of invoices online. The application processes the invoices and communicates the status of each invoice to the vendor. The application directly interacts and writes the submitted invoices to SAP/R3 accounting system. The application deals with all the complexities involved in batch processing of invoices including the business logic and reporting the status of individual invoices. The application runs under SSL for added security. Additional security is provided at the operating system level. The OS authentication is implemented as a COM object developed in Visual C++ that calls LAN MANAGER API to manipulate the user accounts. The approval part of the application is an Intranet application and a manager who owns a purchase order can approve, partly approve or reject the invoice. All transactions directly update SAP/R3 records. SAP is accessed through Remote function calls (RFC) and the calls are encapsulated in VB COM objects. Suppliers can also submit bulk invoices as an Excel spread sheet. Invoice application has upload facility where a user can upload the invoices in an excel file to the server. An NT service written in Visual C++ processes the excel file and creates the invoices using the same set of VB COM objects (code reusability). Should there be any errors a email notification is sent to the vendor indicating the errors in the excel file and the excel file is sent back as an attachment. Another NT Service written in C++ creates and manages the NT user accounts (each vendor ID is an NT user at IIS Server). The service reads a flat file that contains a list of vendors that need to be created or removed. NT Services were used as they can be configured to run on Start up of the server and allow the flexibility to endow some users with special privileges. XML was used to store the vendor preferences and customizations. INVOLVE was developed in Active Server Pages, DHTML, Java Script and utilizes COM, MTS and XML technologies extensively.